The landscapers finished all of the work in our backyard last Thursday. I'm thrilled that it took them only four days to do the work. Overall, we're very happy with the results. The workers were very neat and tidy, cleaning up the patio and removing all traces of their presence on the driveway before they left each day. Contrast this with our neighbour's approach, which is to leave equipment and product he'll be using later on the road. The workers also worked very fast and from what I can tell, they did a thorough job. They all seemed to take a lot of pride in their work and tried to make the new landscaping look nice and blend in with the existing landscaping. I trusted them to plant all of the perennials in the garden wherever they thought they should go because they knew more than I did about these plants. We've done some research on the plants and I think we might want to move them at some point but we'll leave each plant in its current position this year. Of course not everything went perfectly. In particular, we had issues around communicating with the company owner. We'd have been better prepared for them if the owner had confirmed when the work was starting. 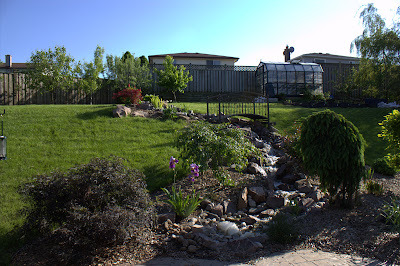 As well, when the owner discussed the job with us, he said that when it came to planting the perennials he wanted us at home so that we could tell the guys where to put them. On what could have been planting day, I called him and asked when planting would happen as I thought he'd wanted us there and in response he said that the guys would lay out the plants where they would go and we could move them. Later on, I talked to the foreman who hadn't been planning to do that at all. That's when I told him to plant them where he thought best. 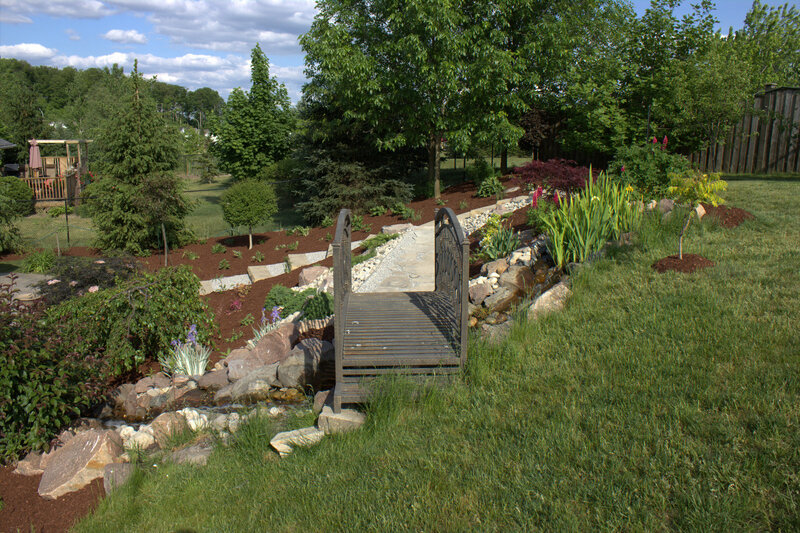 These were small communication problems and we were so happy with the work that we'd definitely recommend Lawrence Lawn Care for landscaping jobs. We have to check but if they have experience with permeable paving like grasspave2, we'll hire them again to make our driveway narrower so that our neighbour can see where his driveway ends... and hopefully stop driving and parking on our driveway. Before. This picture was actually taken last year; the bushes on both sides of the waterfall are much larger this year. The area to the left of the waterfall and bridge is where the landscaping was done. After. Even though this picture was taken at a slightly different angle and includes more than in the Before picture, the differences are obvious. The new landscaping extends from the waterfall over to the about the lilac tree on the lower left of the picture. 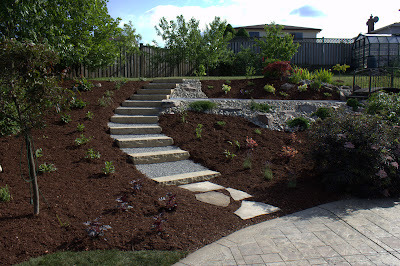 They put the cedar mulch over all of the backyard plant beds to unify the look and while I don't love dyed cedar mulch, it does look nice. We're not loving the aluminum rails on either side of the path between the steps and bridge so we'll be wanting to cover them with creeping plants. A second After view, taken from the other side of the bridge and waterfall. That little tigerseye sumac on the right, there, is going to grow up big and strong. It'll look great once it's fully grown to its 6ft high by 6ft wide self. Behind and just to the left of the sumac is our tulip tree. Gorgeous! I love your backyard! And the waterfall, creek & bridge. I wish I had one!